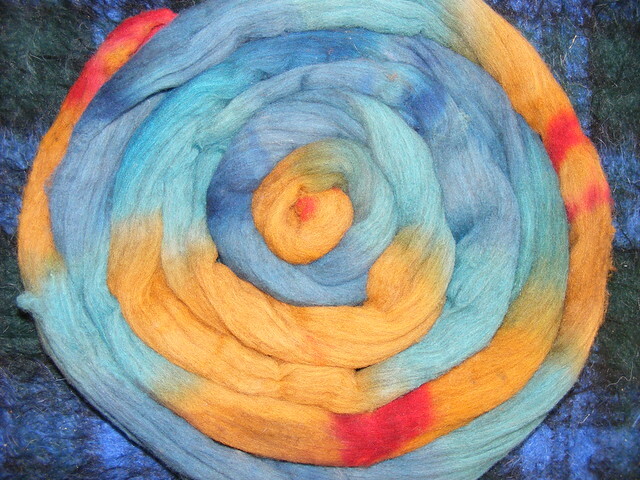 Some new colours and a new wool to be shown off this time. 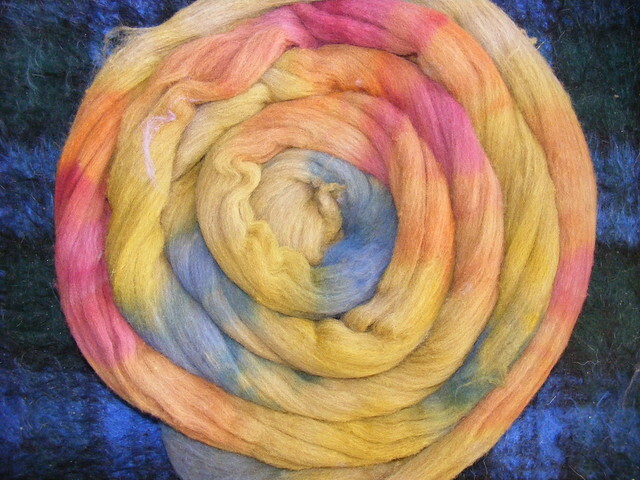 This is a new colourway on white BFL, Peacock Butterfly. And this I took the colours from. 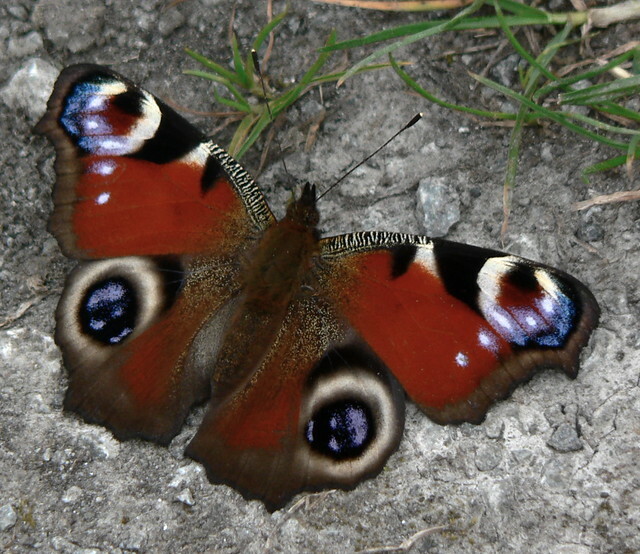 I was with the pupz down by the river one day last week (when it was warm and sunny and not windy) and a peacock butterfly displayed itself on the nature reserve war memorial flat plaque for quite a while. I'm rather pleased with the way I've matched the colours, though this won't work on any fibre darker than the oatmeal BFL. 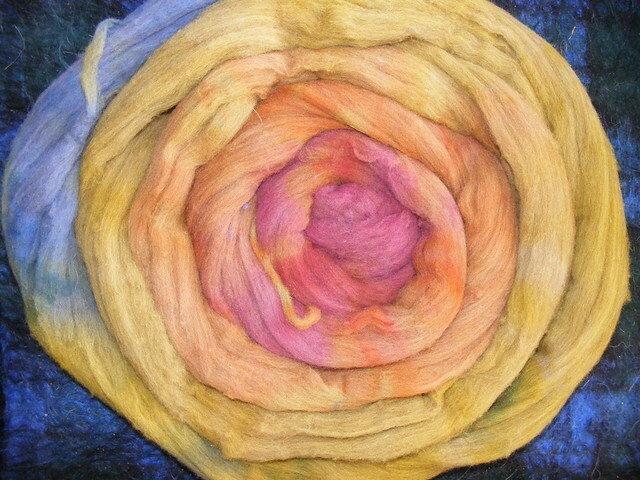 The colours on the wool will, of course, deepen with spinning. 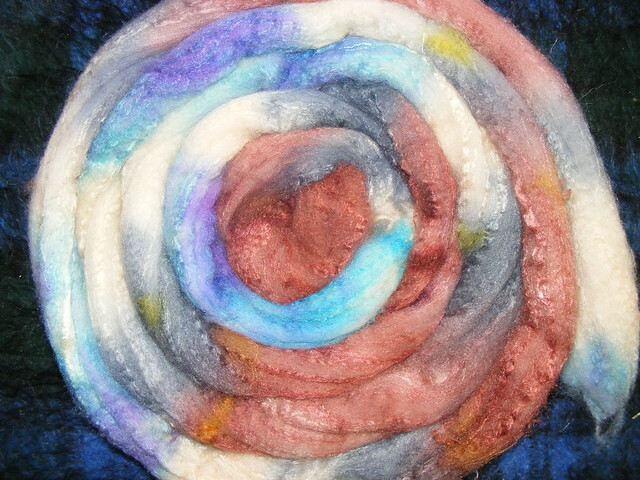 I've also done it on white BFL/silk and oatmeal BFL/silk. 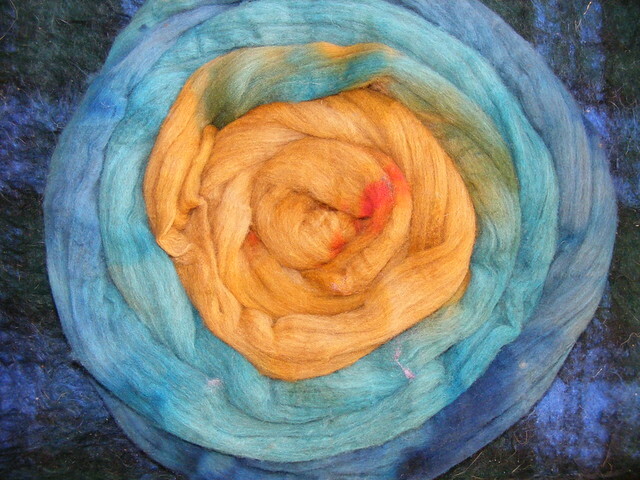 The new wool I've added to my range in Merino d'Arles. It comes in two shades of brown and white, and the paler of the browns (a creamy cafe au lait) overdyes wonderfully. It's a soft, short-stapled top with an incredible bounce, and I've found it spins best in a fairly woollen/long draw style, even though it's a combed top formation. 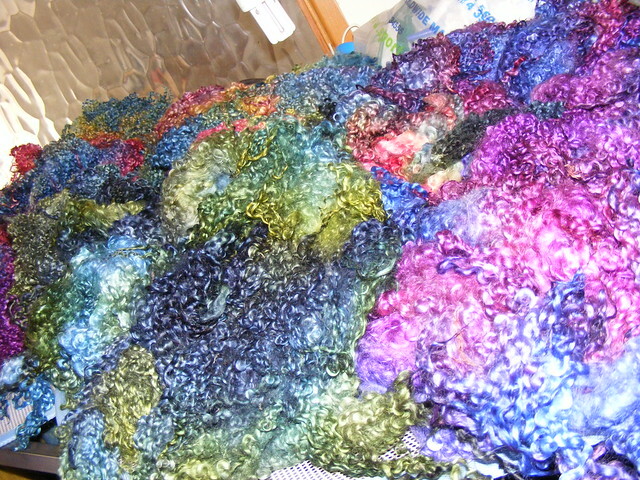 Gorgeous bouncy yarn results. The other thing about the Merino d'Arles sheep is that it's still farmed until the ancient (and I mean really ancient, time out of mind) method of transhumance - the sheep spend the summers up in the heights of the French Massif Central, and the winters down in the valleys. All the photographs below are on Merino d'Arles, the first being the long version of Littleheart, copper shading through magenta and purple and green back to copper. This lot's Cheviot, I think. Some rather bright yellows, but there's greens and reds underneath. 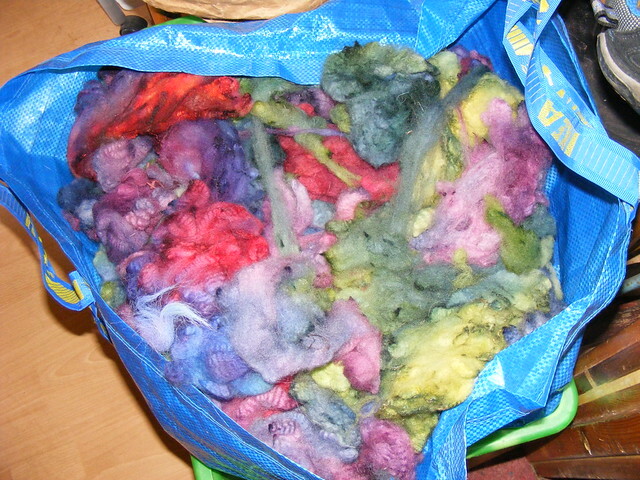 This is mostly an unknown Down-type fleece, but there's also a bagful of rather beautiful alpaca in here too. I can stuff two different types like this in the same storage container as there's no problem differentiating when I come to package it up. Isn't this gorgeous? This is a rather lovely Wensleydale fleece which came out of the pots on Friday evening, and is still on the drying rack. The lustre is quite amazing. And this morning I have finally washed one of the fleeces I picked up at Bakewell last year. Completely unidentified, in a black bin liner, and therefore cheap - but there's a nice ringletty crimp to it and it's soft and very white. 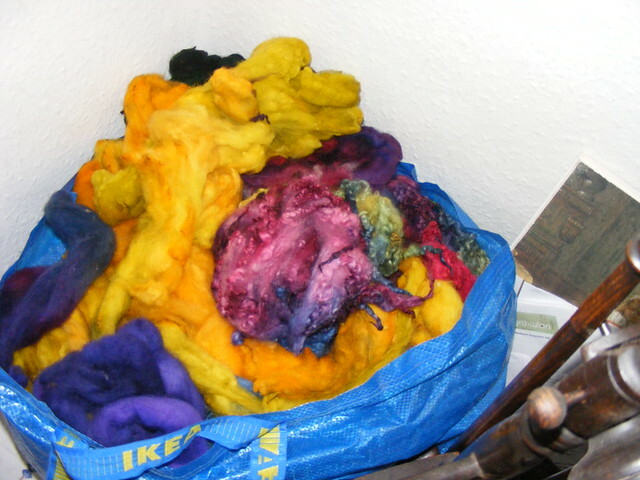 Half of it has been scoured and is in the dyepans, the other half now in buckets of very hot and very soapy water. 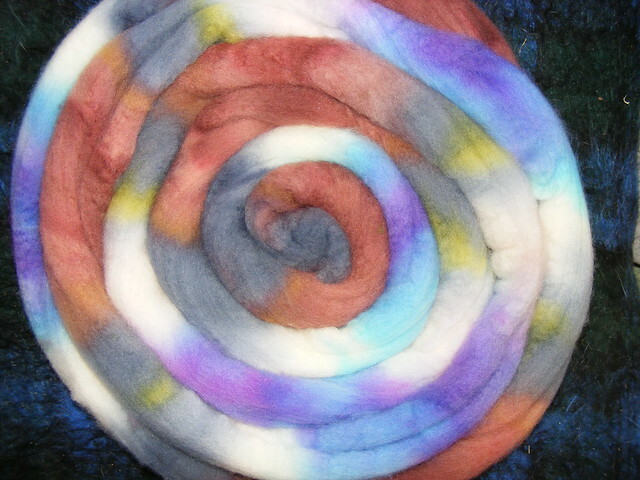 The colours that I put on the fleeces are usually completely random (unless I'm doing a rainbow spectrum) but they often give me surprising ideas for more formal and documented colourways for the tops I dye. Of course, this is assuming I remember to write it down. 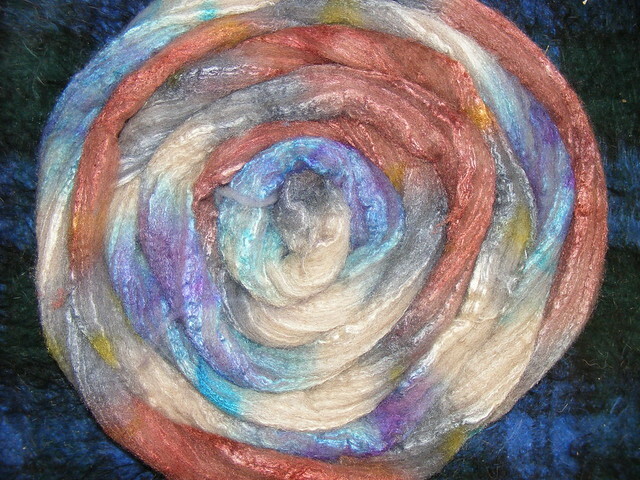 The dark greeny/blue/black that some of the Wensleydale's in was noted down quickly as I spun it out and spread to dry. 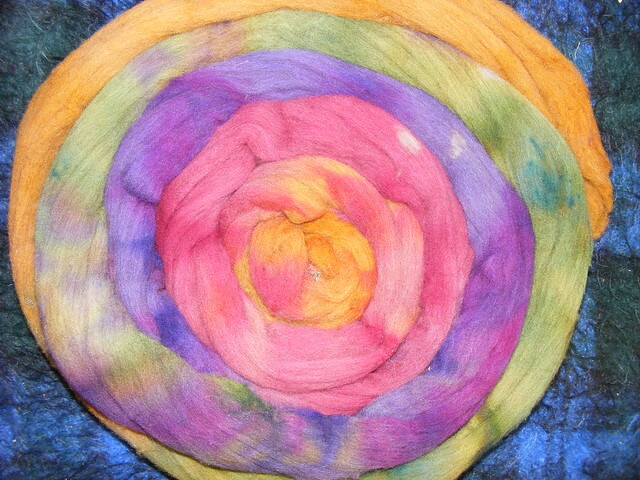 OH dear, I have been remiss - three shows gone by since my last dyeing blog. 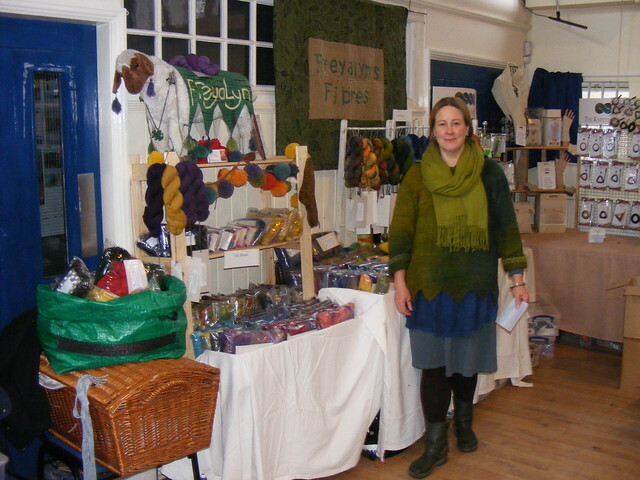 We had an excellent Wonderwool - lots of lovely friends and customers, and did rather well. A week in Wales also went down extremely well - we did some walking, some exploring, met friends for lunch after the show (and had some round for dinner in our lovely cottage beforehand). Not a scrap of telly was watched the entire week, though we did listen to the radio on my laptop. 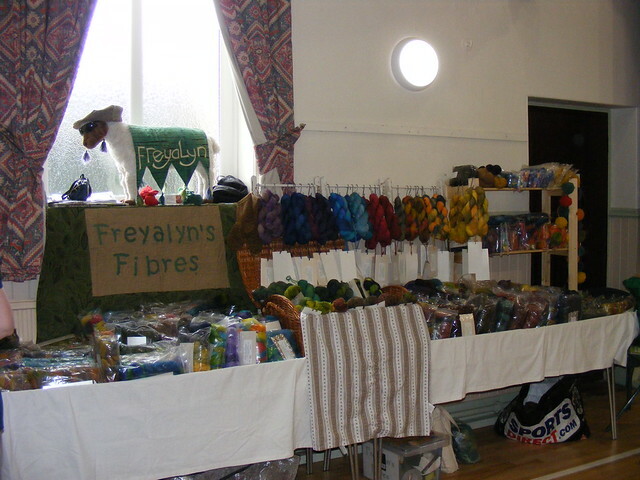 And then the Tynedale Spinners' Gathering yesterday - another group of friends this time, and it always surprises me how well the various stallholders do, considering it's a fairly small group of visitors. On the other hand, this event has been going a while, and its renown has spread far. But we were tired getting home - I snoozed rather than knitting both ways, because Mark's a sweetie and drives. And yes, we managed to make the pupz quite comfy in the back even though there's most of my stall in the back with them. I'm good at building barricades from shelves and portable tables that stops bags of fibre falling on their heads.